NEW YEAR, NEW and Improved Design! It’s a new year (almost), and Picklee has a whole new look! The Picklee brand has grown tremendously over the past year because of YOU, our loyal readers =). So we implemented a few changes that should make your visit even more enjoyable! Some of the changes include a more user friendly layout, expanded categories to make searching a bit easier, new 10 Minute Transformations in our Signature Series category, and even a new logo that better illustrates everything we are so passionate about! We hope you enjoy our new look, and stay tuned for LOTS more exciting updates & projects coming in the new year! Our new logo reflects a fresh & clean handwritten font, along with a splatter of paint (of course)! We love this new logo since a huge part of what we share includes PAINT, and furniture restoration. We’ve re-categorized many of our posts to make them easier for you to find! Just a few of our new sub categories include: Holiday Crafts, Little One’s, Home Improvement, & Primp + Pamper… You’ll also notice our new Signature Series category where you’ll find the our famed Fresh Picked Friday’s, along with Your Pick’s and our NEW 10 Minute Transformations! That was a tough one because as you know, we’re an eclectic mix of DIY projects, furniture restoration, design inspiration, and even fun recipes . Our Picklee concept has always stemmed from our consistent belief that “your home should tell a story”, that’s why we like to create beautiful things right? So naturally, “your home should tell a story” became our new slogan! Creating beautiful things for your beautiful life is our passion. Our new site design features a very clean, simplistic look, along with a soft yellow, gray, and coastal green color pallet. We chose a light gray honeycomb background that (we think) compliments our classic & crafty content. The homepage displays our most recent post in a large, featured format so you can quickly see what’s new. Pinterest brings us lots of new readers daily, and our readers love to share their Picklee findings with their Pinterest followers! So we wanted to make it easier for you to save & share what you love. Every image now has a “pin this” ribbon in the upper right hand corner, so you’ll never forget about your favorite craft, design inspiration, recipe or DIY project! Anyway, enough web jargon and jabber, here’s our new design! 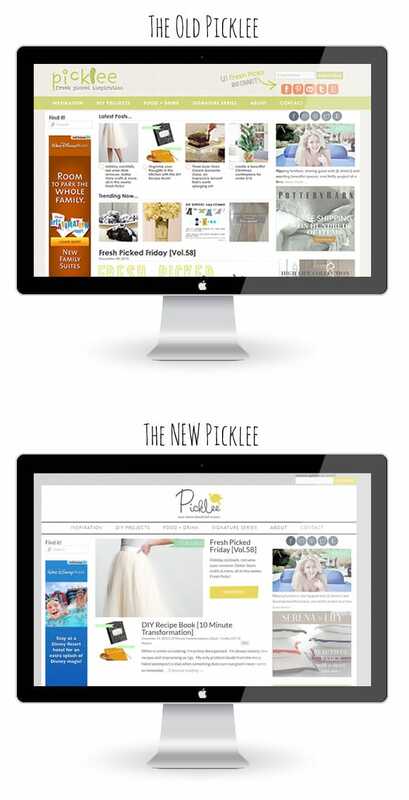 We sincerely hope you LOVE our new look, and continue to subscribe and follow Picklee so you’ll never miss a thing! Stay tuned for LOTS more exciting updates & projects coming in the new year! Share your thoughts about our new look below, we’d LOVE to hear from you! I love the new look! Super clean! Beautiful design, new logo is great too!